One of the most exciting parts of having a preschool-aged child is seeing them start to recognize that those funny shapes they see everywhere around them are letters and that those letters actually represent sounds. Soon after comes the realization that if they can figure out this mysterious language, they too can start to read just like the adults around them! Such an exciting time! 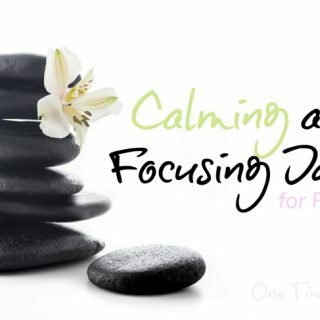 For most kids this process occurs best when the learning happens through a combination of incidental learning, and fun activities. 1. 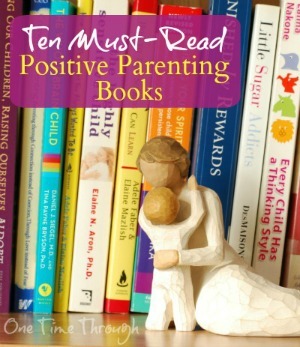 Read with your child daily, and point your finger to the words as you read them. 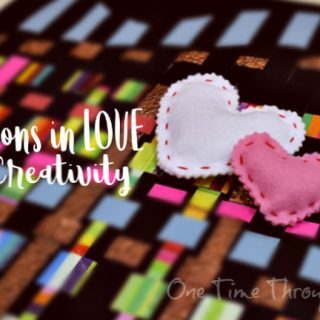 For more ideas on reading with kids, check out our post 4 Easy Ways to Encourage a Love of Learning. 2. 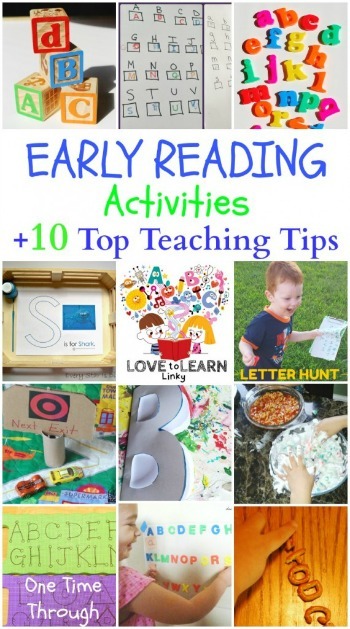 Point out letters and words in your child’s daily environment. The more kids realize that print has meaning, the more motivated they will be to learn to read. 3. Talk about letters and how they represent sounds. 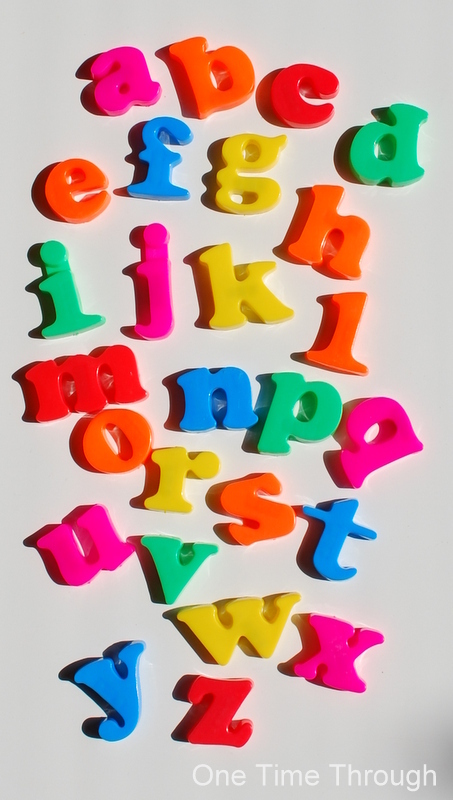 It’s not enough to just learn to recognize the letter names – it’s more important to learn the sounds. Try this fun DIY Phonics Game or this Indoor Alphabet Phonics Hunt, or this Summer Picnic Play Sensory Phonics Bin. 4. 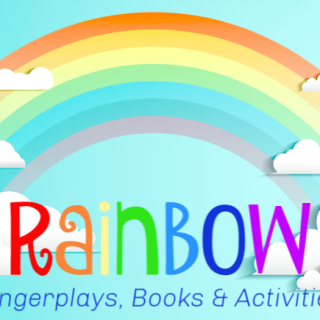 Play letter sound games. Example: “How many words can we think of that start with the sound “Buh?” Baby, bottle, bird, bat, etc. For even more sound and rhyming games, check out this post, Make a Humpty Dumpty Book with Your Child. 6. Learn nursery rhymes together. Learning these wonderful rhymes is often associated with better reading down the road. Read them in books, chant them together in the car, clap and snap them out, walk and say them out loud. You get the idea! 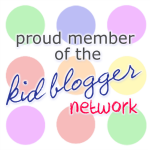 For 10 reasons why these rhymes help language development, read this post from The Measured Mom. 7. 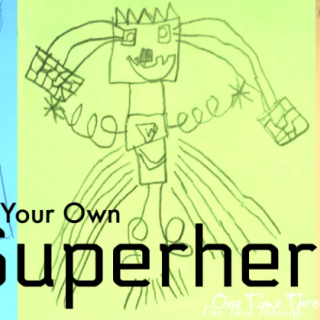 Teach your child to recognize their own, and other loved ones’, names (really motivating) and show them how to sound them out. 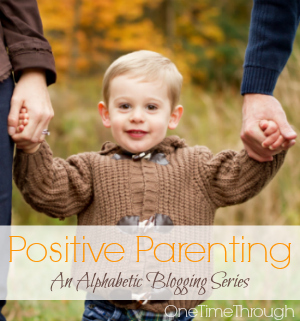 Label things with your child’s name, spell it out with fridge magnets, write it on their art, etc. 8. Write or “scribe” the things your child says. 9. Play I-Spy for letters. 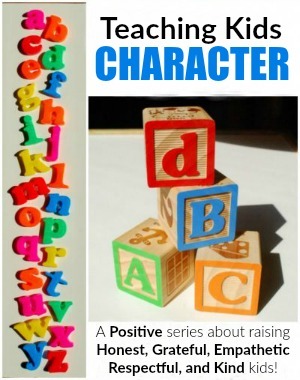 You can do this anywhere that there are signs, or labels, or print visible to your child. 10. 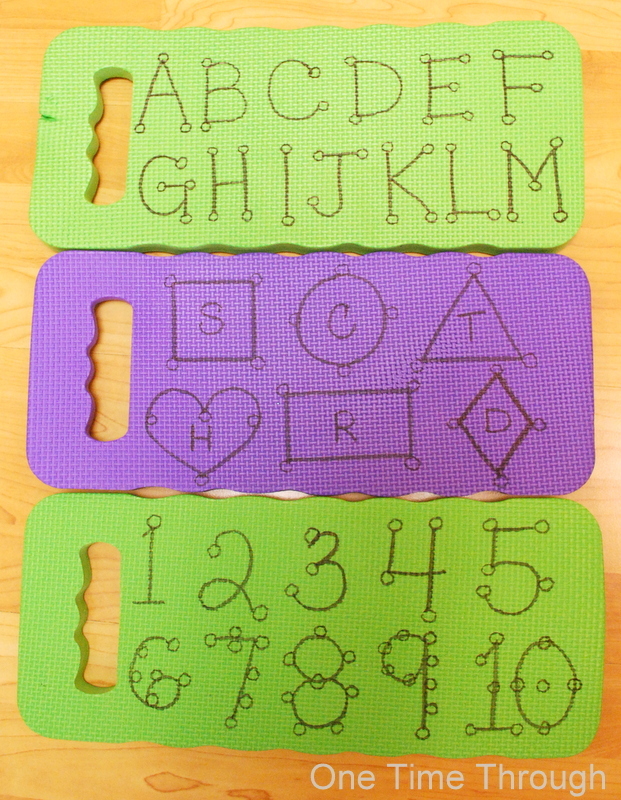 Play together with alphabet toys and/or props. 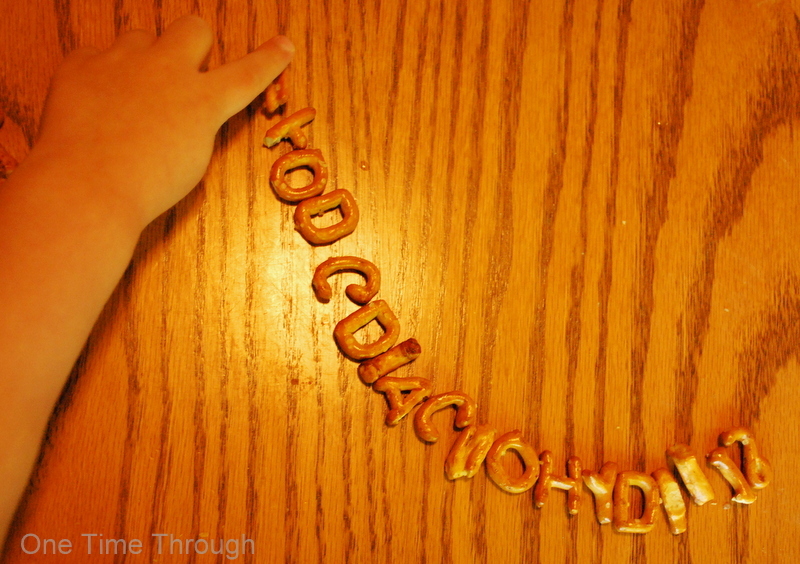 We love eating alphabet pretzels for snack because we can spell familiar words and names, search for and eat all of a certain letter, talk about the sounds that each letter makes before eating it, etc. Alphabet pasta shapes and alphabet soup are also great learning fun! 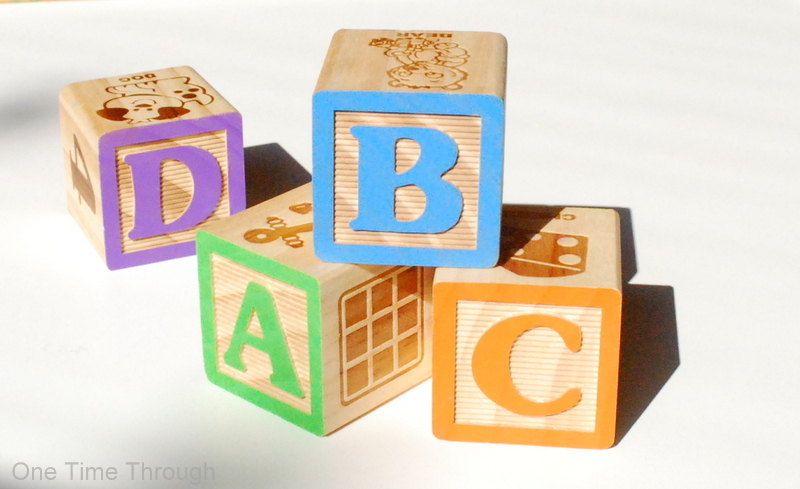 We also like using alphabet blocks to build and play together and they provide a great opportunity to casually discuss the letters and their sounds as we use them. We also enjoy using letter fridge magnets to spell out “secret messages” and names of familiar objects and favourite people! Lastly, Onetime has really enjoyed using his Hammer ‘n Learn play mats to practise his fine-motor skills while working on recognizing the shapes of different letters. 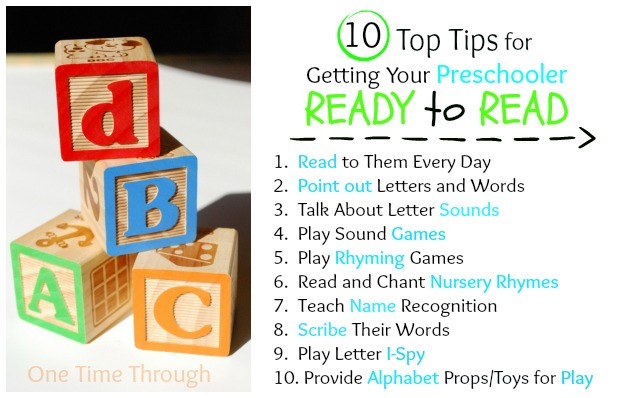 Here is a collection of fun activities for helping to teach young children their alphabet, the sounds of the letters, and how to recognize print. All of which are essential skills for reading. 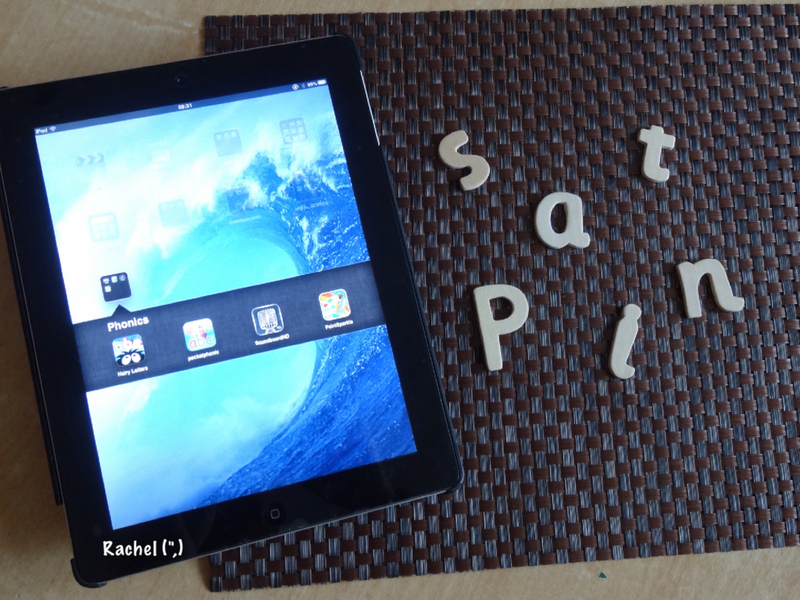 Stimulating Learning with Rachel shares a review of a really cool iPad app that allows kid to make a collection of photos (that they take themselves) for each sound in the alphabet. 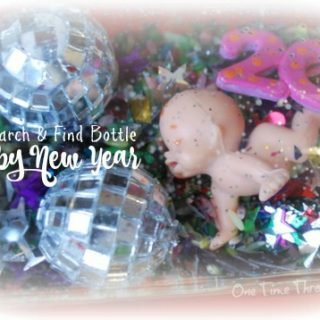 Check out the post for photos and details about how to use it! 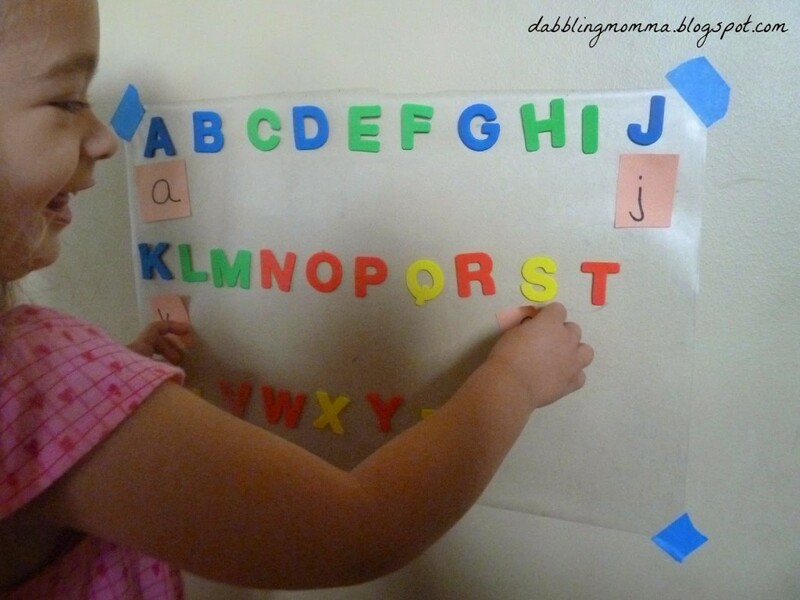 Dabblingmomma has a cute activity to help little ones learn to match their capital and lower case letters. 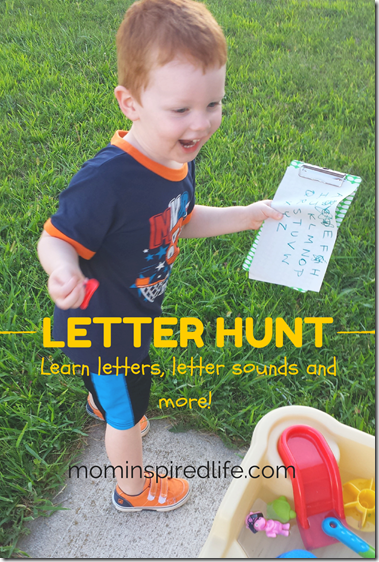 Mom Inspired Life shares an outdoor letter hunt that gets those active kids moving while learning to recognize their letters. 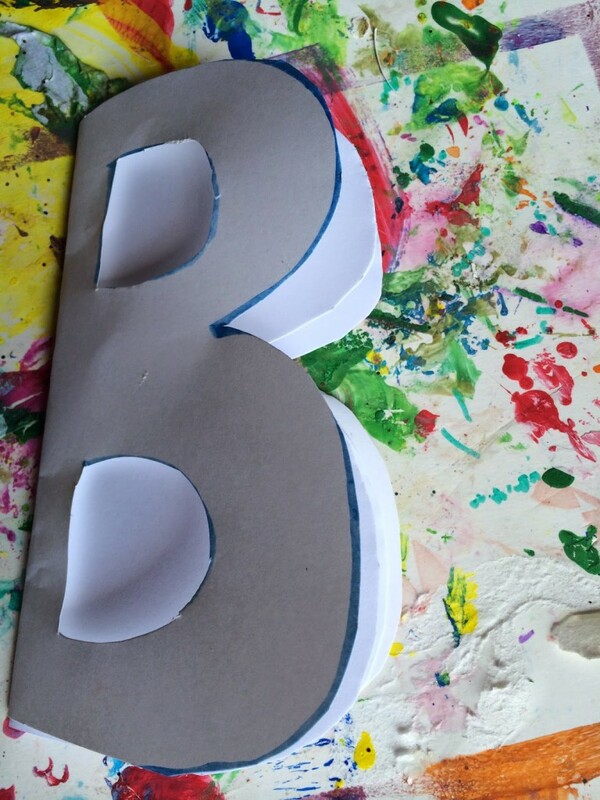 Love this homemade book idea from Mini Monets and Mommies that ties in the “Back to School” theme while teaching kids about the B sound. This could be used for any of the letters too! 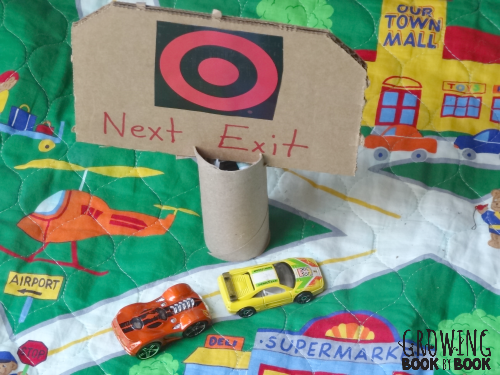 Growing Book by Book shares a really simple way you can help your kiddo start to notice print in their environment, along with a fun craft that would appeal to boys and girls. 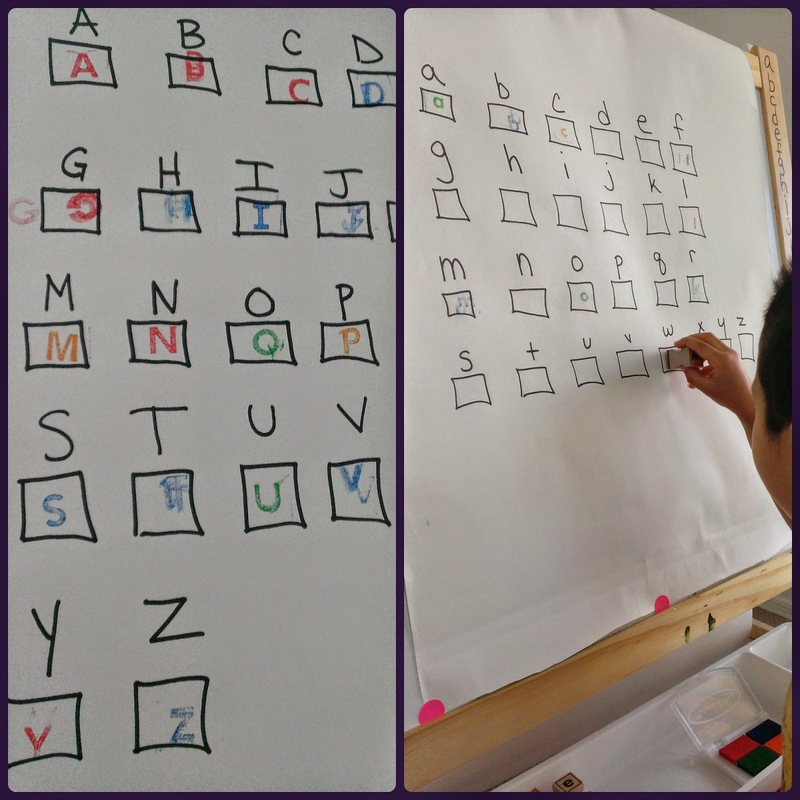 If you’ve got some alphabet stamps kicking about the house, swing over to The Loving House of Mama Casale to see how you can use them to teach your child to recognize letters. 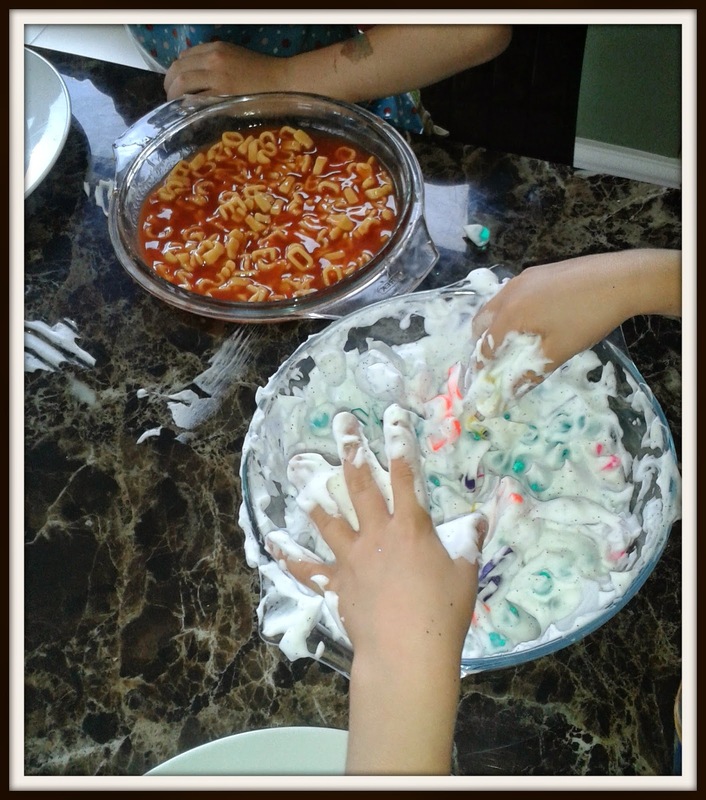 For those little ones who like to get their hands right into the learning – try Multicraftingmummy‘s Sensory Letter Soup activities. 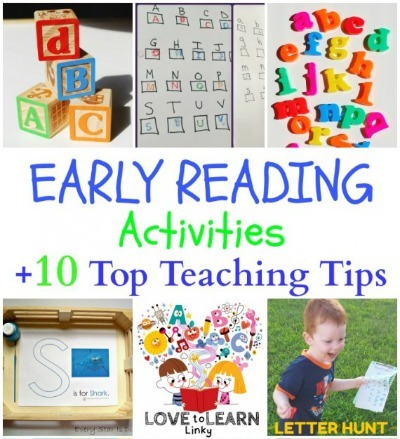 I hope you found some new early reading activities here today to try with your child and remember to click on any of the great new links at the bottom of the post to find even more ideas before you leave! 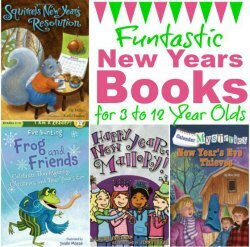 Follow One Time Through’s board Early Reading Activities on Pinterest. And be sure to check out the other features this week from my fabulous co-hosts: Left Brain Craft Brain, and A Little Pinch of Perfect. PIN & SHARE THIS WITH YOUR FRIENDS!